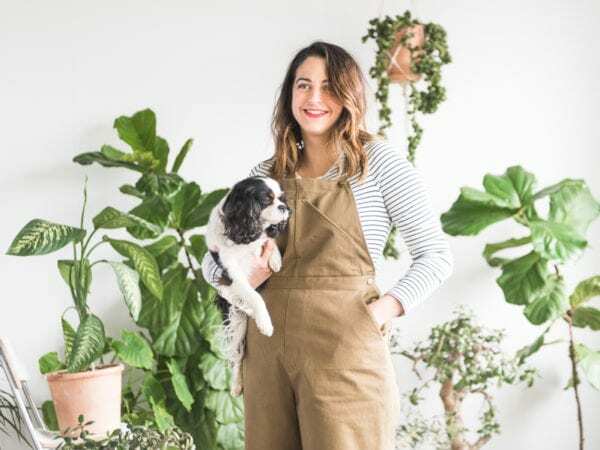 I’m so tickled by everyone’s enthusiasm for our button-front Jenny Overalls hack. 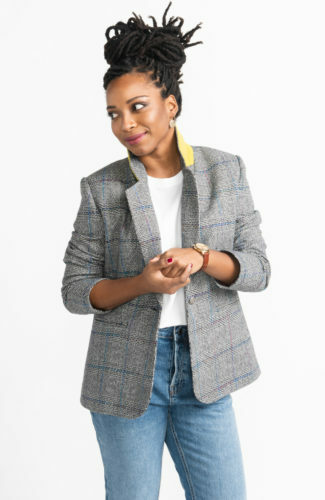 The pair I made is one of my most treasured garments and I’m thrilled to share this tutorial and free pattern bonus so you can unbutton your Jenny with similar abandon. 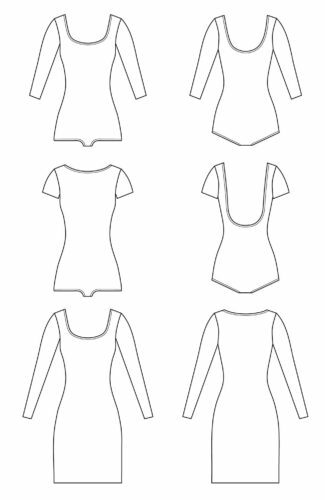 First things first, you will need the modified pattern pieces which you can download below. 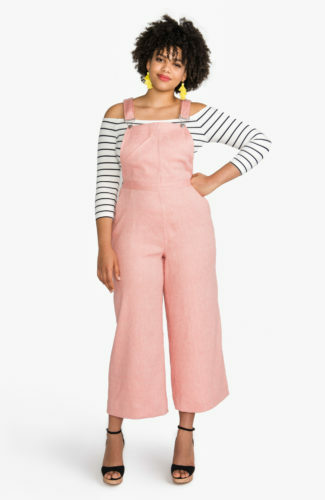 The only pieces you’ll be keeping from the original pattern are the legs (which you will cut out without the pocket opening), the back pockets and the overalls strap. 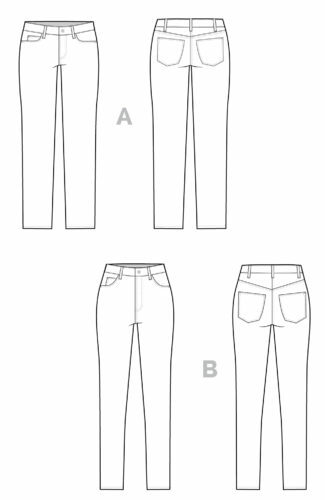 It should also be said that with this pattern bonus, you can now make a pair of button front or fly front Jenny trousers or shorts since we’ve included a new center front waistband and fly extension. I won’t be covering how to do that in this tutorial; see our fly front tutorial or button fly tutorial for more info. 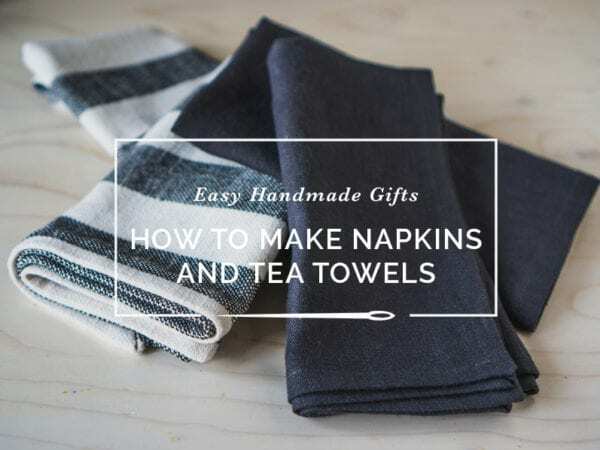 Want to download this free pattern bonus? 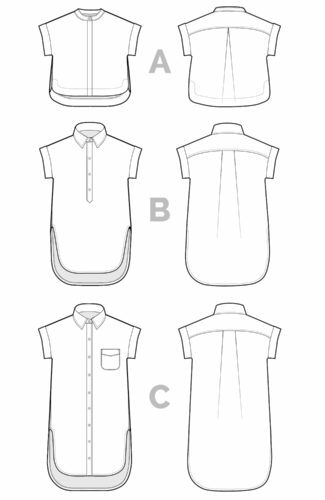 Included in the new pattern pieces are a patch utility pocket, revised bib and bib facing, a waistband that opens along center front, a fly shield and a few new interfacing pieces. 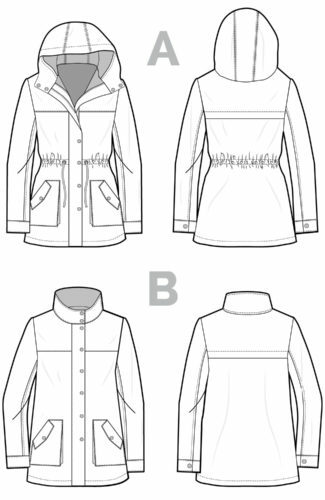 In addition to your new pattern pieces, you will need 8 button closures. 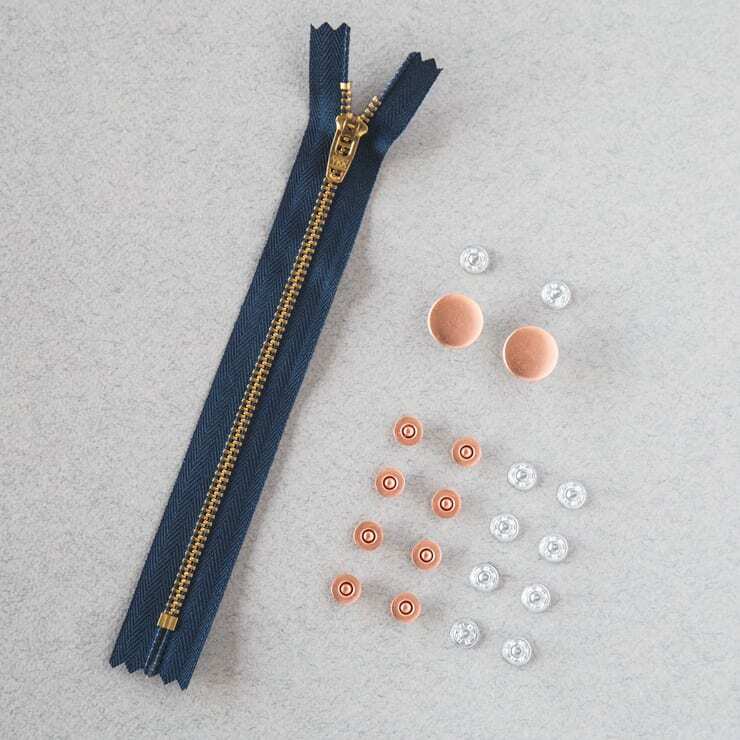 These can be jeans buttons (like the ones in our Jenny kit), regular buttons or snap buttons). The pattern construction changes quite a bit with this mod, so I am going to try and move through everything relatively quickly. Go ahead and sew the back pockets in place along the back legs. 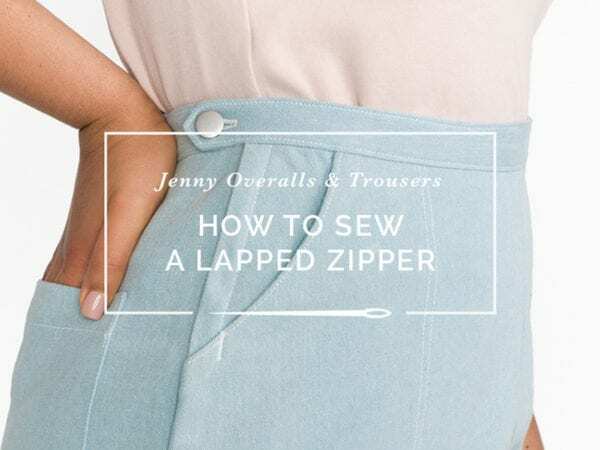 You’ll also want to sew the legs together along the back crotch seam with a sturdy stitch, and then finish the seam, with the option to topstitch it in place if you feel like it (see this post in our Ginger sewalong if you need more direction on this). Now, on to the front! 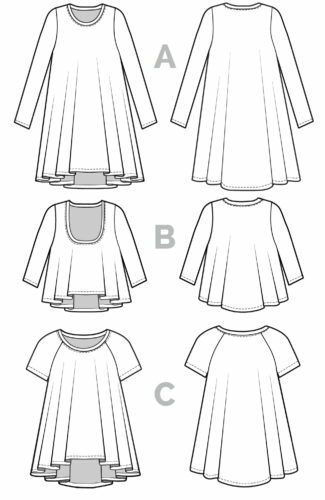 Trim the left bib front (as you wearing it) along the line indicated on the pattern piece; the right front will be slightly wider now. 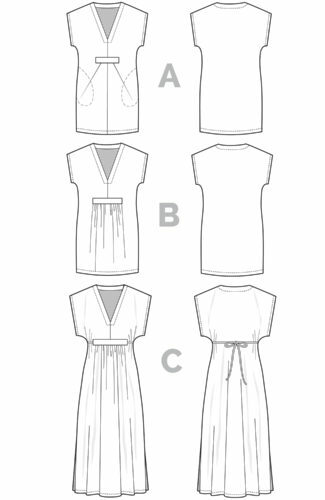 Apply the bib interfacing to either side of your two bib pieces, and finish that straight seam with a serged or zig zag stitch. If you want to ensure the angled side of the bib doesn’t stretch out, you can reinforce it with some fusible interfacing or stay stitching; I didn’t do it with my heavy denim but this might be a good idea with a lighter weight fabric. Now fold each side in along the indicated notches. Fold the bottom edge of the bib facing up at 5/8″. Now with right sides together, align the facing at the top of the bib (unfold that bit you pressed earlier). Now stitch the facing in place, along the angled side seam, across the top, and then down, aligned with the line you pressed earlier on the bib. You’ll have a little excess on each end. Trim and grade the seam so it can be turned neatly inside out. Turn the facing right side out and press. Repeat for the other side. Fold the angled side of the bib under by 5/8″ (in line with the top edge of the facing), and then fold the raw edge under. Finish these pieces off for the time being with some topstitching! Stitch the angled sides at 1/4″ and the top at 1″. Now topstitch center front in place with one row at 1/8″ from the edge, and another at 1 1/2″ from the edge. Repeat for the other side. 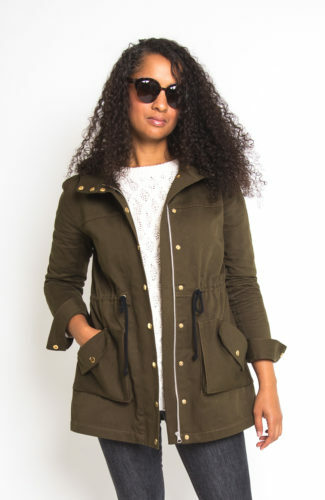 Put the fronts aside for the time being and grab your two pocket pieces and two pocket linings. I forgot to snap this pic, but you’ll want to trim the pocket linings down by 1/8″ at the side, bottom and along the curved edge. This will help conceal the lining once it’s sewn together. Interface the fabric along the curved edge to prevent this seam from stretching out. Now line up pocket lining to pocket, right sides together, and stitch along side, bottom and curved edge at 5/8″. Trim and grade seams so pocket can be turned neatly right side out. The lining should pull to the inside a little bit since it’s slightly smaller. Press thoroughly. Topstitch curved pocket opening at 1/2″ from the edge. Line up pockets on front leg and pin in place. Topstitch pocket in place, 1/8″ from the edge on the straight side and bottom. Baste remaining sides in place inside seam allowance along side and waist seam. Once both pockets have been sewn on, prepare the front legs. Serge the fly extension of the left leg, and trim 7/8″ from the fly extension of the right leg. Line up the legs, right sides together. 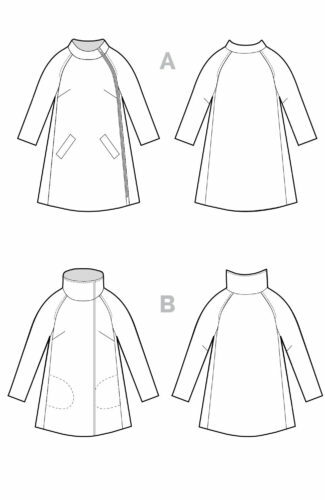 Now draw a straight line from the center front notch along the waist to the circle mark on your pattern piece. 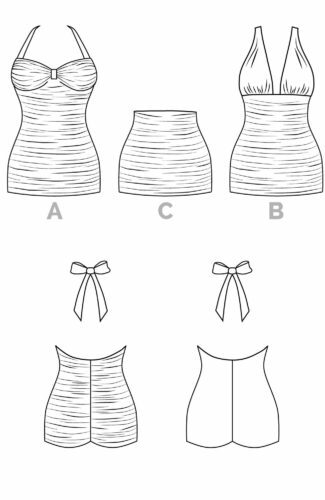 This is your stitching guideline. I forgot to snap this pic, but using that line as your guide, use a long basting stitch and sew front legs together from waist to circle mark. 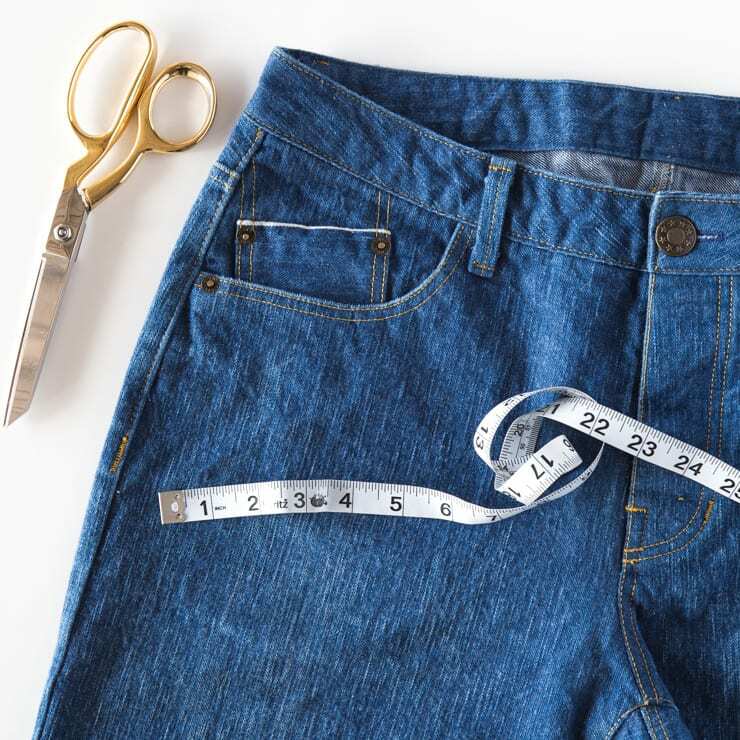 Once you hit the circle mark, backstitch, switch to a shorter stitch length and continue sewing down the crotch seam at 5/8″. Finish the bottom crotch seam and trim by about 1/4″; use a serged or zig zag stitch here. Press fly extension open. 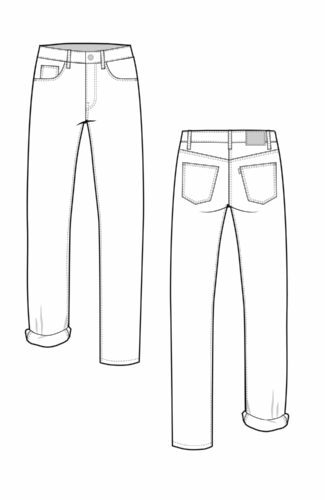 From the right side of the pants, topstitch the left fly extension and crotch seam to the left leg of the pants, 1/8″ from center front. Using the fly topstitching guide, draw in your fly topstitching with a removable marking tool. 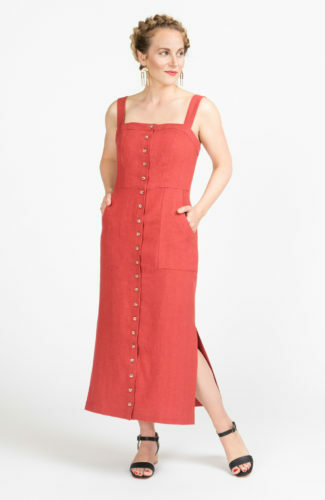 Line up the left bib with the waist seam so you ensure that vertical line of topstitching is a consistent width along the front of your overalls. Topstitch the left fly extension in place. Press the fly shield in half, right sides together. Stitch bottom edge at 5/8″ and turn right side out and press. Line up with the trimmed edge of the right fly extension on the wrong side of the pants and pin into place. Stitch the shield to the right extension using a 1/4″ seam, and then serge or finish with bias tape. Flip open fly shield to expose the right fly extension. Press in place. Topstitch the right fly extension to the fly shield, about 1/8″ away from the fly shield seam. 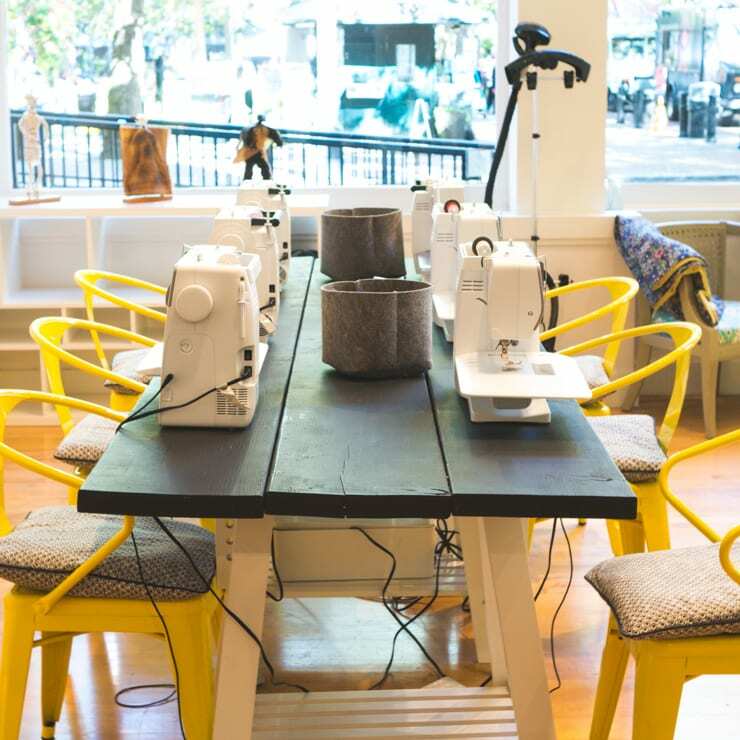 Ensure you are not sewing through the legs! Fold the shield over to the left leg along the center front seam. Stitch a few bar tacks through the front pants and fly shield. The most important one is where the fly stitching meets center front. Now that the front is done, stitch the front and back legs together along the inseam and side seams. If you need more direction on that, see this post. Topstitch the side seams in place the length of the pocket, and finish with a bar tack at the end of the stitch line. Rip out the basting stitches along the fly. On to the waistband! 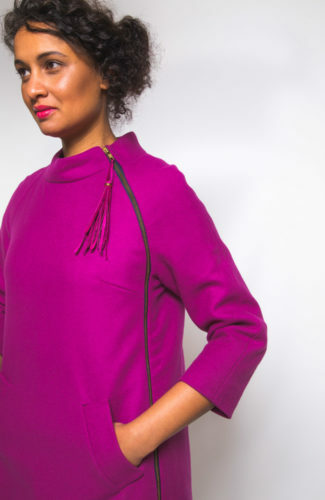 Make sure it’s interfaced and pin it in place along the waist seam. Stitch in place – note there will be extra along the left leg. Press seam up. Draw a straight line along the waistband to mark the edge of the fly. Line up the bib face down along this guideline. The goal is to line things up so the center front leg, waistband and bib form one continuous line. Repeat for the other bib. Pin the straps in place at the back as directed in the instructions. Stitch bibs and straps in place just inside seam allowance. Fold one edge of waistband facing up 5/8″. Now align facing with waistband, sandwiching bibs and straps in between. Stitch along entire waistband at 5/8″. Now square off the waistband corners on either by stitching a straight line directly in line with edge of fly. Trim so it can be turned right side out. Turn the waistband right side out and press all the way around. Grade seams to reduce bulk. Topstitch in place all the way around at 1/8″, starting and stopping at center back. See this post for guidance if you need it. You’re almost done! 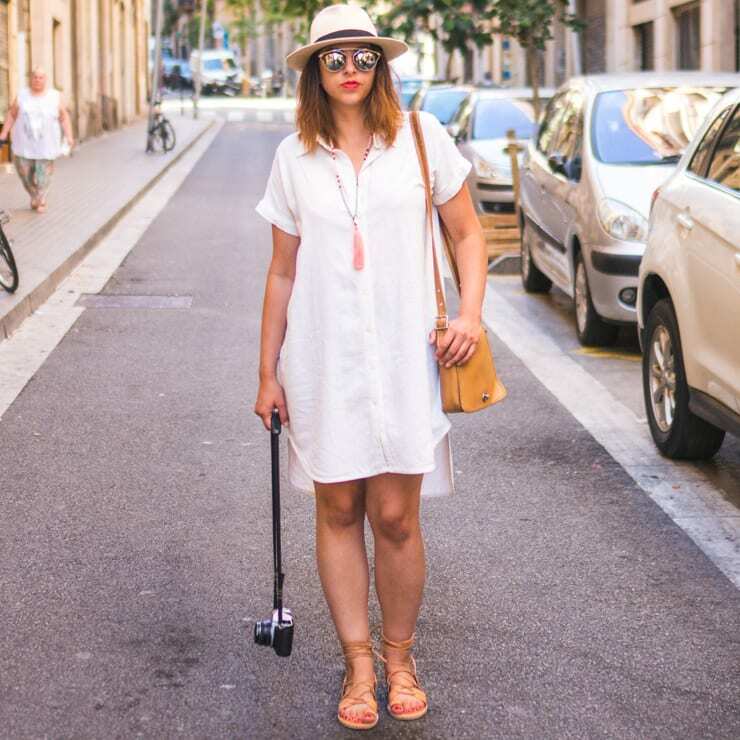 Now to identify the location of your buttons. I used my buttonhole gauge here but you can also just measure the area and divide in equal amounts. I suggest four on the bib, one on the waistband and three along the fly. See our post on sewing jeans buttonholes for help with this. Our hardware kits for Jenny include enough buttons for this modification. Alternatively, you could install a spring or ring snap to make these even easier to get on and off. 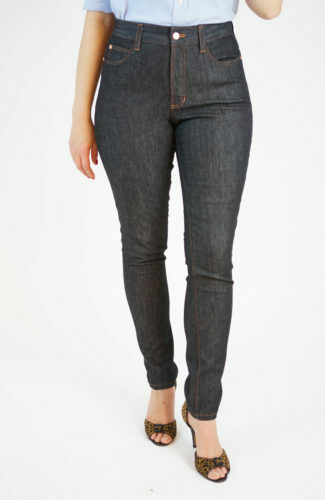 Once your buttonholes are sewn and cut open, install your jeans button using this video tutorial. AND BOB’S YOUR UNCLE! Phew! 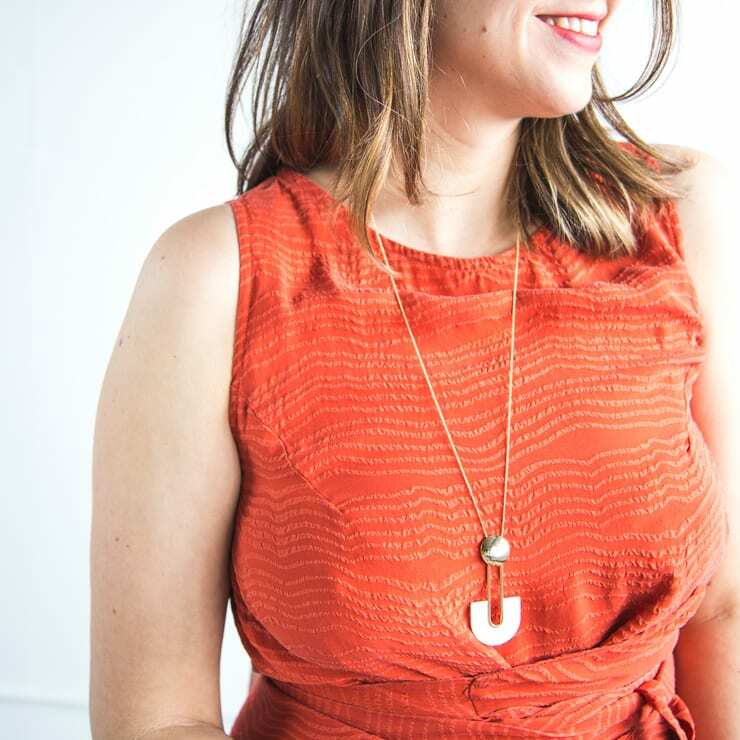 Hope this tutorial helps you make the button-front Jenny of your dreams!